Put them in a sling, and my pulse quickens. While the rest of America focused on swimmer Michael Phelps' finger-wagging after he won his 20th gold medal this summer, I was interested in a different Olympics story. French gymnast Samir Ait Said first caught my eye when he shattered his tibia and fibula upon landing his vault during men's team qualification rounds. After I read that this isn't his first injury — he also broke his leg before the 2012 Olympics — I fell in love. Later, when the Games were over and Said was safely in the hospital, I cuddled up to my husband. "Tell me again," I asked him, as he stretched his right arm over his head to work out a soreness that remained more than a decade after he fractured it. Patiently, he explained how once, in college, he flipped over the handlebars of his bike and broke his arm. I asked him to pause on details, no matter how mundane, like how he got to the hospital (a pizza delivery Good Samaritan), what position he fell in ("hands first," he says, wincing), and what happened to his bike (he doesn't know). I've heard the story countless times, and it never gets old. At night, I fantasize that I was there. Perhaps I met him in the ER, suffering my own injury. Or that instead of the pizza guy, it was me who picked him up and stayed with him in the hospital, distracting him from his pain. I've always been fascinated by broken bones, despite — and likely because of — the fact that I've never been injured. I don't think about the pain or the sweaty cast or the awkwardness of crutches. To me, an injury is fundamentally, undeniably cool. Every guy I've ever dated has had a broken arm at some point in his life. My high school boyfriend was in a cast when we met, and I can't say that had nothing to do with my attraction to him. There's an inherent sexiness to an injury, even in men I wasn't previously attracted to. Put them in a sling, and my pulse quickens. But my fascination doesn't end with hot, hurting men. Ever since I was a child I've wanted to break a bone. I have a vivid memory of sitting in kindergarten, daydreaming of the future and what I wanted my life to be. In my life, I thought, I want to be cool. So what's cool? I remember only one thing I listed that day. Breaking a bone is cool. I have no idea why the thought popped into my head, or why it never went away. Perhaps it's because my older sister once tore her hamstring and I saw firsthand the attention she received. Except I don't remember her injury or recovery at all. The only thing I took away from her experience was the leftover crutches and ACE bandages, which provided years of entertainment for me. My favorite slumber party game was "broken leg," wherein my friends and I would hobble around on crutches. 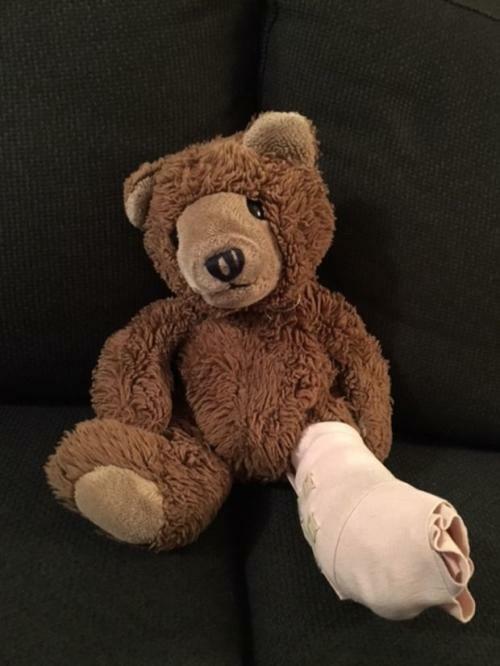 I would regularly wrap my teddy bear in bandages, giving him casts and a sling. Before the deck on my house was built, my best friend and I would make the five-foot jump out of the sliding glass door into the backyard, hoping to break our legs. Still, I never actually tried that hard. As much as I envied broken bones, I was always a cautious child, avoiding tree climbing and contact sports in favor of indoor pursuits like coloring and watching The Adventures of Pete and Pete on Nickelodeon. Somehow even then I knew this obsession was weird. When I played "broken leg" with a fellow babysitting charge, I felt bashful about the name of the game and simply called it "doctor." When the sitter found out, she insisted we leave the bedroom door open when we played. Much later I was mortified to figure out the grim implications of "playing doctor" with a child. I came of age with the burgeoning internet and frequented completely innocuous teen chat rooms. It was the early days of lying about yourself on the web, and I told people I was two years older than I really was (yet another thing that didn't occur to me as inappropriate at the time) with a cast on my leg and a great story about how it got there. Just as people have done for decades since, I used the internet to seem more interesting than I was. This could also be considered low-level Munchausen syndrome. Meanwhile, I also had the desire to help those who were hurt. In high school I wanted to be an orthopedist, until I realized a.) that they're required to perform surgery (gross) and b.) my grades in biology were lacking. Even now, I fantasize just as much about being the caregiver as I do about being injured. When I tell people about my obsession, they always say the same thing: "You wouldn't feel that way if it happened to you." They're right. The fact that I haven't been injured is precisely the reason I'm interested in it. It's the same reason I, in my idyllic suburban childhood, read books about teens with cancer and children who had been kidnapped. It's never happened to me. The closest thing I've had to a serious injury is when I jammed my finger in seventh grade gym class. It turned purple and swelled, but — much to my chagrin — the bone stayed intact. Since I've never experienced the trauma of an injury, that kind of pain is foreign and fascinating to me. In my mind, those who have endured that deep brokenness are immediately tougher, more interesting. If I've never felt that sort of pain, how do I know I could survive it? As a child, I envied the attention garnered by an injury. The good story, the special treatment, the being taken care of. As I grew up, I relished taking care. Yes, it would be an ego boost to make someone forget their pain — there are a thousand pornos built on just this premise — but it's deeper than that. If I can help someone else, it proves that I'm worthy, needed. As an adult, I know that I don't want to break anything, nor do I wish it on anyone else. But that won't stop me asking for my husband's story, or imagining my own.